Compare prices from several car hire companies in Tenerife and find the best price for car rental. Our prices always include unlimited mileage and insurance. Tenerife is the largest island in the Canaries archipelago situated in the Atlantic Ocean off the northwestern coast of Africa. Tenerife has a population of over 220 000 (2009). 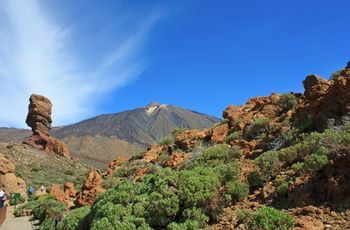 Tenerife is a popular holiday island and each year there are approx. 5 million tourists here because of the island’s lush scenery and beautiful beaches. The island consists of several towns, of which the largest is Santa Cruz de Tenerife with museums, historic buildings and beautiful parks. The main tourist town of Puerto de la Cruz as deadlines including a water park, an amusement and animal park and a botanical garden. Tenerife North Airport and Tenerife South Airport are the two international airports on the island and located respectively in the north and the south east of the island.